It was 2am by the time I got back to Cardiff from Belfast and the British Society for Eighteenth Century Studies postgrad and early career conference, and by 9 I was up and clothed and in the university in time to catch the second day of the BARS Romantic Imprints conference. BARS – that’s the British Association of Romantic Studies – is one of the largest conferences in the discipline of English Literature, and the change in scales was vertiginous. BSECS only had one or two panels per session; BARS never had less than seven or eight. The collected abstracts of the BSECS papers covered a dozen sides of A4; the BARS abstracts had been collected in book form, with a table of contents and an index at the back. BSECS only needed one or two rooms; BARS took over an entire building, and annexed the cafeteria of another. At this scale there was far too much happening for the conference organisers to keep track of, so Anthony Mandal and Jane Moore recruited a small cadre of conference reps, myself among them, to make sure all the speakers were adequately hydrated, the PowerPoint presentations hadn’t crashed, and to handle any emergencies. Anthony had contrived to make us instantly recognisable by providing us all with bright yellow t-shirts with the conference logo on the back, and we swiftly became known as the yellow minions, after the wacky goggled monsters from the Despicable Me movies. We were from every conceivable level of the academic hierarchy – postdoctorate, doctoral student, postgraduate, graduate and undergraduate – but we developed fast friendships and a striking esprit de corps over the course of the conference. The first panel I supervised, ‘Locating the Imprint’ was enlivened by multiple dives for the light-switch since the building seemed only willing to give us twenty minutes illumination at a time. This didn’t too much disturb a fascinating panel – the material on obscure literary clubs and books rejected from the Bodleian for being too populist turned out, in typical academic fashion, to be a mine of interesting details and unexpected connections. Leonard Driscoll’s paper on John Clare’s antiquarianism also proved to be deeply engaged, not just with the countryside that John Clare knew and the material traces that remained, but with Clare’s poetry as well – something that can often get buried in papers that deluge you with background detail without a particularly close examination of the text. John Clare – a poet my secondary school teacher once dismissed as ‘a gardner who went mad’ – seemed to be having a good conference, with a plethora of interesting papers. Rejack examined the reproduction of those lines in various contexts throughout the nineteenth century, after which I brought things into the twenty-first – and caused a small sensation – by admitting I had them tattooed on my right shoulder! I rounded off the day with a panel on ‘The Romantic Writer and the Imprint of the Humanities’, where Brecht de Groote’s paper on Thomas De Quincy caught my imagination. There’s no sound quite like the murmur of an academic audience with its interest roused, and a striking susurrus arose as de Groote showed De Quincy grasping the onset of the information age, and going on to predict something strikingly similar to the internet. I skipped the plenary lecture in order to go offer comfort and consolation to an unhappy friend of mine who had travelled all the way down from Newcastle to present a paper, only to be struck down by food poisoning on the very first day! That evening’s entertainment was the early career pub outing, and it was a pleasure to catch up with various people from earlier conferences, and to buy my MA dissertation supervisor, Mary Fairclough, a drink at last. Some serious drama erupted when Alex, one of my fellow yellow minions, who had a nut allergy, started going into anaphylactic shock and had to be whisked off to hospital by Mikey Goodman, the hero of the hour. Alex was stable, however, Mikey was back before last orders, and the rest of the evening passed without life-threatening incident. The next day’s began with a panel on ‘Coleridge’s Afterlives’, populated by Philip Aherne, Anna Mercer and Jo Taylor, all of whom I knew from an earlier conference, and none of them worse for the previous evening’s adventures. Philip reprehended me for paying too much attention to Coleridge’s poetry, which is a mere 10% of his total output – and neglecting his prose; Anna Mercer analysed some of the poems of Sara Coleridge, his daughter, somewhat of a new discovery and still causing a stir in Romantic circles; while Jo Taylor did a paper on Coleridge’s grand-daughter Edith, the winner of the Coleridge-least-likely-to-acquire-a-major-critical-edition award, which was an intriguing consideration of how to analyse and make use of terribly bad versifying. At the next plenary, I nipped down to the stage to check the organisers wanted for nothing. The speaker, Devoney Looser, was friendly, eye-catching in peacock leggings and one of the few academics to bring her kids along, but it wasn’t until Gillian Dow introduced her to the lecture theatre at large that I realised she was that Devoney Looser – famous for proving that academia and roller derby are not mutually exclusive, and known to her team-mates as Stone Cold Jane Austen. Her paper on the illustrated editions of Jane Austen’s novels was an interesting examination of a little regarded area, and I made a note of a few editions to investigate. 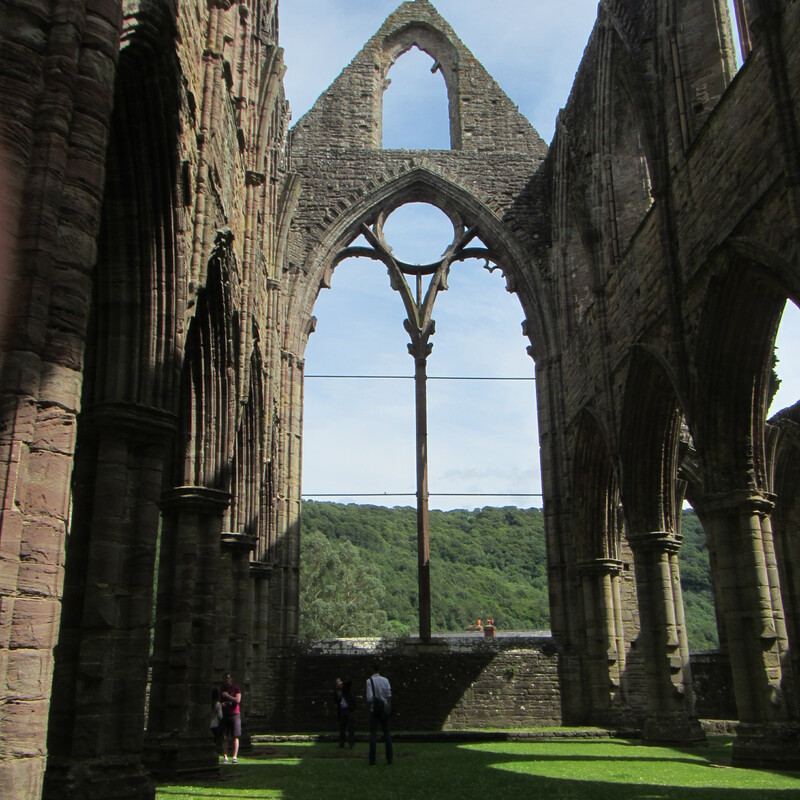 The afternoon featured a coach trip to South Wales’s Romantic Location of choice: Tintern Abbey in Monmouthshire. I’d walked past it many times before, following the line of the riverbank or peering down from the Devil’s Pulpit on Offa’s Dyke above, but it was the first time I’d actually spent time among the ruins. A poetry reading had been laid on for us, but sadly the acoustics were far inferior to when the roof had been vaulted with grave arches rather than open to the sky above us – but there was something to be said, I mused, for listening to Wordsworth’s great ode as ‘a soft inland murmur’, sprawling upon the greensward while the swallows flit in and out of the empty chancel windows. Getting all the academics back onto the bus turned out to be like herding cats, and we still would have ended up short a few if someone hadn’t had the bright idea of checking the pub. There was just time in Cardiff for us reps to dash home, throw off the yellow t-shirts and don the gladrags for the conference dinner. What a crowd of luminaries there were, packed into the dining hall, and how pleasant to troop up to the stage and receive our acknowledgements for helping the conference come to be such a success. I stayed up afterwards – with my friend Harriet as my glamorous assistant – to read out the raffle tickets. Nicola Watson, the president of BARS, was kind enough to come over and say that if I somehow didn’t get a teaching job after a PhD I clearly had a bright future ahead of me as a bingo caller! After dinner and several glasses of wine, we trekked over to the Urban Taphouse, where over another couple of pints of high a.b.v. ale the subject of my Keats tattoo came up again. Some of the ladies were importunate to catch a glimpse of it. Which is how I woke up the next morning and realised I’d just done a striptease in front of bunch of academics and a senior Jane Austen scholar. A 9:30 panel on a Sunday morning is never easy under the best circumstances, but somehow, I hauled myself up from the shower floor and went into university for the final day of the conference. ‘Material Culture and Intermedial Relationships’ turned out to be worth the effort, covering such little-considered artefacts as literary annuals, relief maps and ceramic transferware: the description of how the ceramicists swooped down on new books of topographical views like a flock of vultures was arresting, as was the analysis of how they collaged their compositions from various sources. In despite of the fact that the speaker, Peter Garside, was one of the nicest academics it was my pleasure to dogsbody for all conference, inquiring politely into my PhD and Miltonic interests, the plenary lecture ‘Another Golden Age for the Novel?’ proved beyond my (by now severely limited) comprehension. I dallied in the last panel session for two excellent papers on Robert Southey before heading downstairs to take part in the general clean-up. Then Anthony and Jane said their closing words – there was a round of applause – and all was suddenly over! I had survived the week of conference bedlam with nothing more than a mild case of the caffeine shakes and the loss of a few IQ points through sheer fatigue, and I had just enough left in me to cycle home before I lost consciousness. A success by any measure!